Size: Adjustable Strap. Color: Black; Quiet Harbor; - Advance your Life! Our sleep masks are made from natural cotton against your skin, has an “air breathing” material as middle layer and a gabardine outside to hold a comfort shape after washing. Also all materials are hypoallergenic great for people with sensitive skin. Buy for yourself or as a gift or consider it an investment in your healthy sleep, meditative Yoga, travel accessories. Why so many people are using a sleep mask? Melatonin regulates the day-night cycle of the human body and controls the recovery phases during the sleep. Producing of this hormone requires sufficient darkness and light prevents it. Even a little light acting like a digital alarm clock for our brain. 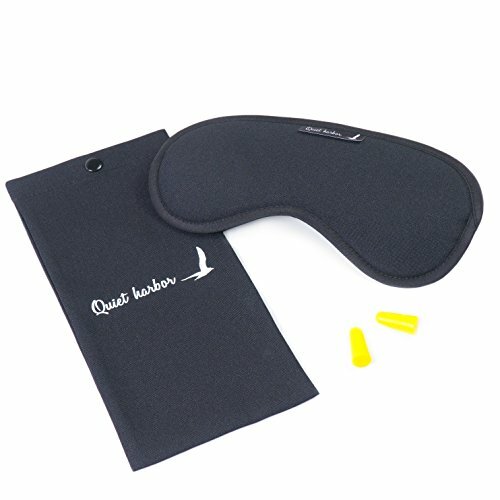 - if you are looking for perfect relaxation during yoga or meditation - Quiet Harbor Mask is your RIGHT CHOICE. ATTENTION! Mask Bag should be ironed inside out or throughout some cotton material. A sleep aid and eye relaxing mask with ear plugs. An unique gift for anyone wanting deep uninterrupted sleep. Sweet dreams! Gentle easy-to-adjust headband won't tangle hair vs masks that use VELCRO. And the plastic adjuster stays at the back of your head not at your temples which can be uncomfortable for side-sleepers. Fits comfortable with ear plugs. Ideal for insomnia migraine headaches and dry-eye sufferers as the breathable natural material passes over healthy oxygen keeping dry air out. Get the benefits of total blackout at home in a hotel or on the plane/bus/train where bright led light and dry air can be especially harsh . The perfect travel accessories to help keep you feeling rested and refreshed. What will you get? - One High Quality Sleeping Mask; - One Set of Ear Plugs in flexible package; - One Convenient carry pouch to improve it use time. If you have any questions about this product by Quiet Harbor, contact us by completing and submitting the form below. If you are looking for a specif part number, please include it with your message.